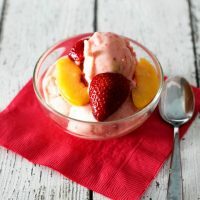 Interested in a super simple, easy to make vegan strawberry peach ice cream that you can make in just minutes? Ummmm, Yeah! Who needs full fat, super sugary ice cream or dessert when you can make this delicious “ice cream” in just minutes and still satisfy your sweet tooth. The best part is that it has no added sugar and relies simply on the natural fruit sugars for just the right amount of sweetness. This is about as close to a guilt-free dessert or treat as you can get without just drinking a glass of plain old water. You’ve probably all tried blending frozen bananas for nice cream at some point but there is no reason to stop there. 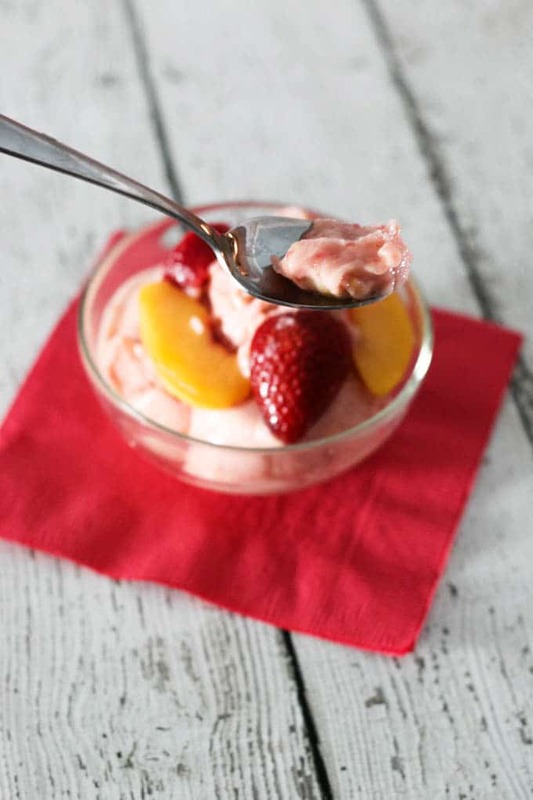 Try as many different fruit combinations as you can and you can have this healthier version of ice cream every day. 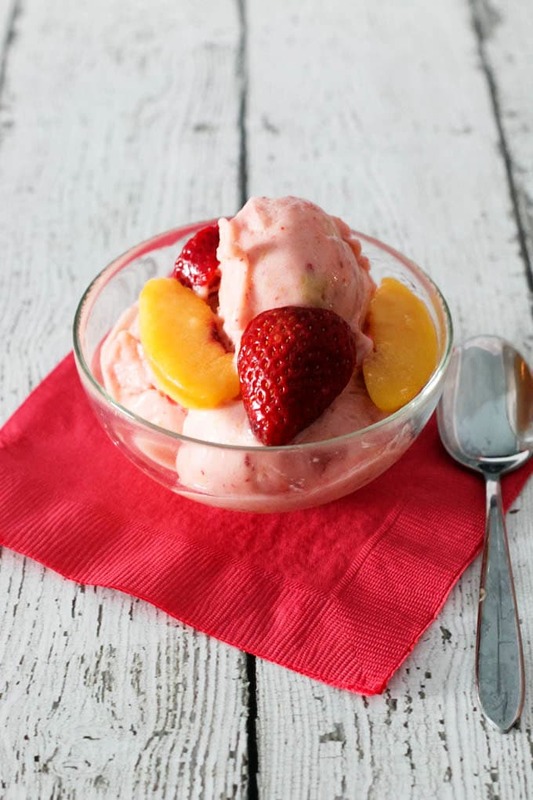 Keep your freezer stocked with different fruits like berries, bananas, peaches and pineapple. For a more indulgent option try adding some nut butter. Ohhh just thought about my next flavour combination. Stay tuned. How easy is it? Well, let’s just say that it is almost impossible to mess this one up. Worst case scenario, you’ll end up with something that resembles a smoothie instead of ice cream. You like milkshakes, right? So that isn’t so bad. It is literally as easy as dumping in your frozen fruit, adding milk (I like to use Almond milk) and blending away. Don’t be afraid to use your tamper to push the frozen fruit into the blades. I like to stop blending when the mixture begins to look like ice cream but still has some chunks of the fruit sprinkled throughout but that is just a personal preference. This is best served right away, as it has the consistency of soft-serve, so I highly recommend making it just in time to enjoy. 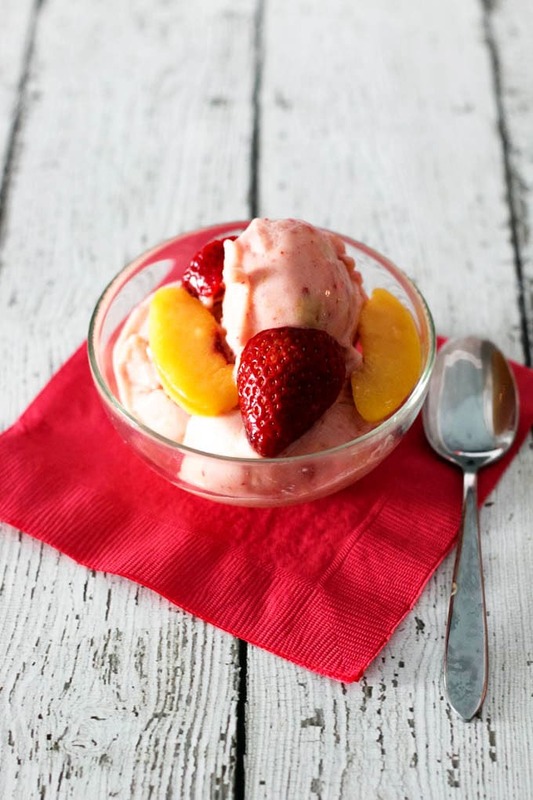 Why not top it off with some additional fruit or your favourite ice cream toppings. Turn blender on variable speed 2 and using the tamper push down the fruit. Slowly increase the speed to 6. Blend approx 20-30 seconds or until you reach the desired consistency. I’ve been wanting to try ice cream in my Vitamix since I got it a few years ago, but have never gotten around to it! This recipe looks so creamy and delicious, and I love that it’s all-natural. Definitely making this soon! It is super simple and so many great options. Beautiful pictures and is very tempting. Yumm..!!!! It is so simple and guilt -free. You have to try!